- Measures: Width: 360 cm Depth: 060 cm Height: 240 cm Weight: 2500 kg - 2 year Guarantee! - Free Shipping! 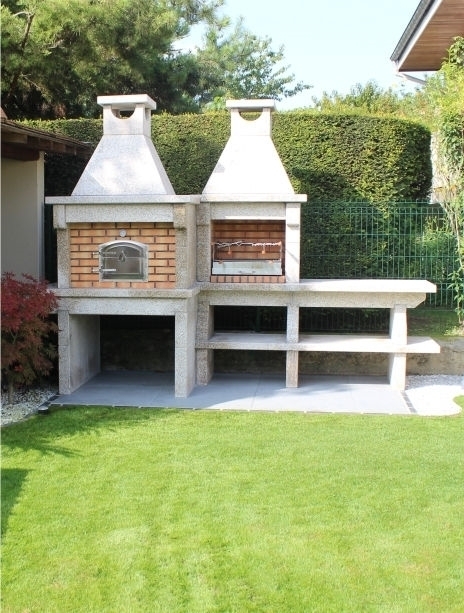 Garden Natural Stone Barbecue GR56F. Free shipping to England, metropolitan France*, Monaco, Belgium, Luxembourg, Italy and Spain. For other destinations pleasecontact us. 1. Cook the chopped onion in 1 tbsp Filippo Berio Olive Oil gently until softened, cool then mix into the minced beef with the Worcestershire sauce and season. Form into 4-6 equal-sized burgers, then cover and chill for 30 minutes. 2. Heat 4 tbsp oil in a heavy frying pan, add the onions and cook on a low heat for 10-15 minutes until soft. Add the sugar, cook until onions are deep golden, keep warm. 3. Brush the burgers with the remaining oil, cook on barbecue for 10-12 minutes, turn once during cooking. 4. Serve in lightly toasted hamburger buns with the caramelised onions and a crunchy side salad.